Bangalore is dotted liberally with various bakeries, with each of them having their own claim to fame - VB Bakery or the local iyengar bakery in every suburb. For those from Bangalore, you might remember the Khara buns, Masala Toast, Palya Bun and the famous Dil Khush and Dil Pasand. I miss soooo much of Bangalore these days, especially when mom and sis are there, and I aint ! To overcome that boredom and nostalgic what started as baking bread turned into an adventure and a totally new bake by itself. Without boring you with the details, all I can say is that every bite that we took of this yummy and spicy Khara buns (Khara in Kannada means spicy) took me back to the leafy lanes of Bangalore and the holiday / weekend afternoons we spent munching these beauties hot and fresh out of the nearest bakery :) :) The browning on top didnt happen as I expected, but nevertheless I enjoyed making these. Any pointers on how to perfect that golden brown (what you see commercially at stores / bakeries) will be great. I dont know if this is the oven playing truant or the temperature settings or the milk wash, but am ready to learn from all of you although I followed the steps to the T for this recipe. However, it was extremely soft and yummy to munch on these. Even kiddo who doesnt take to savoury bakes managed to grab some on her way out to play. S and me enjoyed this over the weekend with steaming cups of tea (for him) and lemonade (for me). 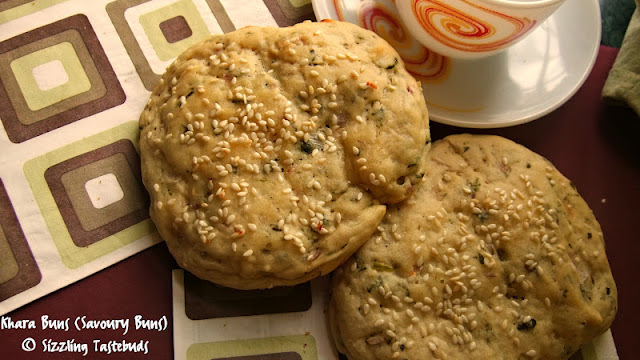 Adapted from here, this was one delightful evening adventure for me :) After the Moongdal Masala Buns & Wholewheat Herbed Buns, I am sure this is another wonderful addition to the bakes at my home. I would have gladly traded APF with wholewheat for this, but was in a predicamant how they would turn out ! Sending this to Blogging Marathon and Raji's event Only snacks, event by Pari. Check out the other marathoners here. 1) In a bowl, mix lukewarm milk and water. Add sugar and yeast and dissolve them. Cover with a cling wrap for 20 – 30 mins. Let the yeast proof. If the mixture is flat and doesn’t turn frothy after 20 mins, throw away and start with a new batch of yeast. 3) Meanwhile. Sift maida and salt together. Add the melted butter to the proofed yeast mixture and mix well. Make a well in the dry flour and add the yeast-butter mixture and with a whisk, stir around till you get a sticky dough. Knead well on a oiled and clean surface for 8 – 10 mins till you get a smooth dough. 5) Once the dough doubles, take it out and punch in for a few minutes to release the air. Make equal portions of the dough and flatten them into quasi flat structures. 7) In the last 10 mins of the 2nd rise, preheat oven to 190 deg C. After the 2nd rise, gently apply milk on the buns and sprinkle sesame seeds. 8) Bake at 180 deg C for 15 - 17 mins til the tops turn light brown. 9) Once done, immediately brush them with some more butter (they stay softer this way). Serve as a evening snack for your family ! When I visited Blr last year, I made sure to taste some (read lot) khara buns. This is one of my favourite, even when I baked the top did not brown as much as I would have liked. Thanks for linking this to my event. 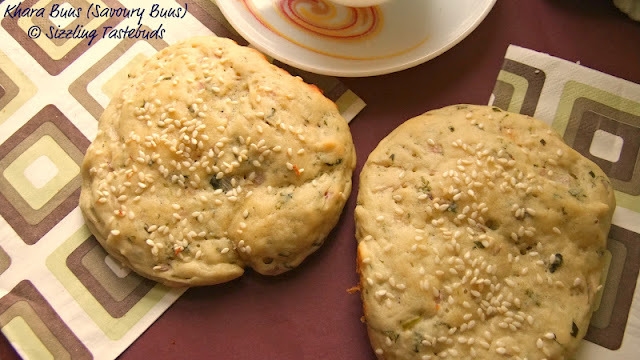 wonderful spiced buns..bookmarking this one!!! Wonderful looking buns, can see that you brushed ur buns with milk, for eggless baking usually i brush the buns with butter before baking to get the top brown..Hope this helps.. I love khara buns from bangalore bakeries.. yumm! Good one! Love savory bakes!! I love reading your post. It is very enjoyable. I think you need to add baking powder/ soda to get it to brown if you baking without eggs. It gives the golde/ brown toasted color you are looking for. I am reading about bread baking now, because I need to bake perfect bread by this year end. Buns look fresh and inviting and how can a child resist them! As matter fact, even adults. Nice khara buns..would taste so good with tea. I too miss these buns will surely give this a try and let you know if I can come up with the perfect browning. i used to love khara buns & you got me nostalgic too.. loved butter sponge & the iyengar bakery in jayanagar too :)..bookmarking this & i am going to make them soon! 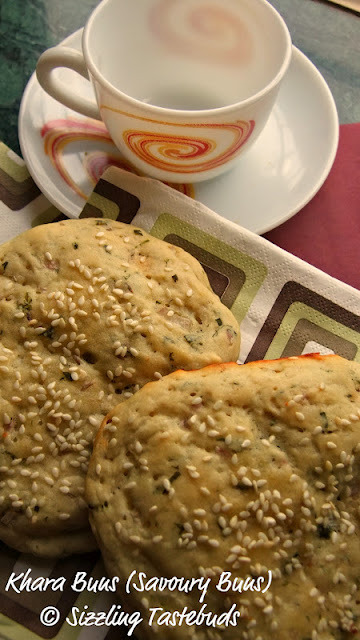 yummy khara buns, perfect with tea. we too love the stuffs from Iyengar bakery, but has not tried their buns, this looks so appetizing and perfect to T.
I have tagged you with 7*7 award , do try it out. looking fwd to ur link fest.